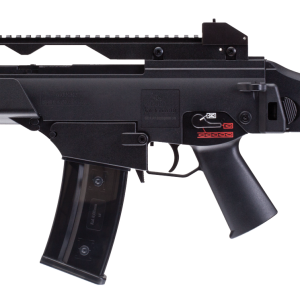 The thrill of Close Quarter Battle (CQB) on an airsoft field isn’t complete without a real combat tool spraying BBs at every squeeze of its trigger. 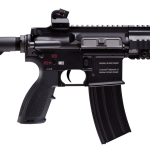 This Umarex airsoft rifle isn’t just any authentic firearm replica, it’s an H&K BB rifle driven by metal gears, made with high-end components, and built with a metal receiver and metal rail interface system that seems to never end. The thrill of Close Quarter Battle (CQB) on an airsoft field isn’t complete without a real combat tool spraying BBs at every squeeze of its trigger. 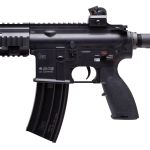 This Umarex airsoft rifle isn’t just any authentic firearm replica, it’s an H&K BB rifle driven by metal gears, made with high-end components, and built with a metal receiver and metal rail interface system that seems to never end. Its high capacity magazine of 320 rounds keeps you in play and its high-torque motor gives you the power you need when the action around you is non-stop. 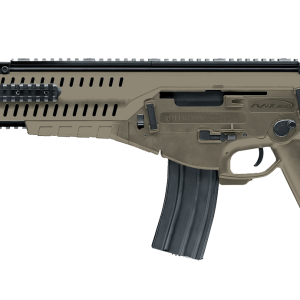 The short barrel and 3-position crane stock make this professional grade tactical rifle easy to carry and conceal when tactical response is high. 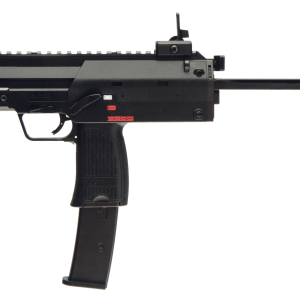 UMAREX HOLDS THE WORLDWIDE EXCLUSIVE HK-TRADEMARK AND EXTERIOR DESIGN COPY LICENSE FOR USE WITH THIS PRODUCT, GRANTED BY HECKLER AND KOCH GMBH.